Councillors, hospital staff and members of the public launched a blistering attack on plans to ‘downgrade’ two wards at Louth County Hospital, at an extraordinary meeting of the town council on Monday evening (September 17). As reported last week, Lincolnshire East CCG is consulting on two options concerning patient bed numbers across Manby and Carlton wards, which were reduced from 50 to 16 last summer while fire safety improvements were carried out - with the NHS giving assurances that the bed numbers would be increased again. Monday night's meeting was well-attended by members of the public. However, neither of the two options offer a return to the previous bed numbers, and instead focus on a ‘home first’ approach to care. This approach was reiterated by Lincolnshire East CCG’s chief finance officer, Sandra Williamson, alongside local GP and Medical Director of the CCG, Dr Yvonne Owen, at Monday night’s meeting - with both insisting that evidence shows patients being in hospital longer than necessary can be detrimental to their health. The pair also insisted that there are no plans to close the hospital, with Dr Owen saying it would close ‘over her dead body’. However, Councillor Jason Garrett said he was ‘absolutely disgusted’ by the latest proposals, saying that his family have been forced to travel further away for medical treatment because local services have been lost. He said: “You’re saying the hospital won’t close, but what services are going to remain? To rapturous applause, Coun Garrett added: “You’re not increasing services anywhere, you’re taking more and more away. 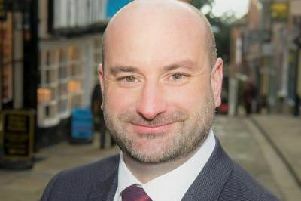 Mayor of Louth, Coun George Horton, voiced his concerns over the town’s growing population - potentially with 2,000 more dwellings in the pipeline for Louth. Coun Eileen Ballard said more pressure would be put on other struggling hospitals across the region - which, due to poor public transport links, could potentially take ‘up to six hours’ for residents from Louth and Mablethorpe to reach. Coun Andrew Leonard said: “Over the years, we’ve re-painted the picture so many times, and here we are looking at painting the picture again in a different way. “My worry is that at some stage that canvas will become totally useless and you won’t be able to re-paint the picture any more. The Mayor of Mablethorpe, Coun Steve Palmer, spoke up from the audience and said: “CCGs and hospital trusts are only doing what they’ve been forced into doing by lack of funding. We are not investing in our health service as we should be doing. “All this fudging around is just trying to adapt to this underfunded service. Hospital staff members also spoke out to condemn the changes that they say have made their job more difficult. Battling through tears, one hospital worker said: “We are family. Patients coming to us do not lose their independence, because we work bloody hard. Campaigners from Fighting 4 Louth Hospital said in the past they had been ‘dismayed’ at the lack of support from the town council, apart from the Labour group, with some councillors making accusations of ‘scaremongering’. Mayor of Louth, Coun George Horton, stressed the town council was ‘not against’ what the campaigners were doing but said procedures had to be followed. He called on everyone to ‘work together’ for the sake of the hospital. Town councillors agreed to hold a public meeting at a larger venue in the coming weeks - more details as we have them.